This month our guest speaker is Garrett Ruhland, CEO and co-founder of Biomarker.io. Join us on July 24 to discuss fundraising and pitching strategies. Expect a quick review of the basics and prerequisites early-stage startups must have in preparation to seek capital. Then, we’ll dive into a discussion about methods for creating your investor list, preparing your pitch, and constructing a timeline. Garrett is an accomplished startup founder with experience in biotechnology, digital health, and software development. He will leverage his expertise in the translation of highly technical concepts into commercially viable solutions to present practical and effective strategies perfect for companies at any stage of the fundraising process. The CEO Roundtable Discussion is held each month during lunch, provided by RocketSpace. The goal behind this monthly meeting is to give members the opportunity to sit down with their peers to exchange ideas, discuss common challenges and, of course, network. The CEO Roundtable Discussions are only open to current RocketSpace members who are founders or CEOs. 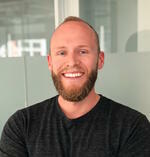 Garrett is an accomplished startup founder with experience in biotechnology, digital health, and software development. Garrett is an expert in translating clinical research into commercially viable solutions. His strengths reside in his ability to fluently communicate between clinical, engineering & management teams to facilitate optimal collaboration and project execution. He has prior experience in operational roles at truBrain as Chief of R&D, management roles as Chief Medical Officer at Koroit Capital and CEO at Biomarker I/O.